Chinese New Year Pomelos- Pomelos for Chinese New Year! Lucky Chinese New Year Pomelos! 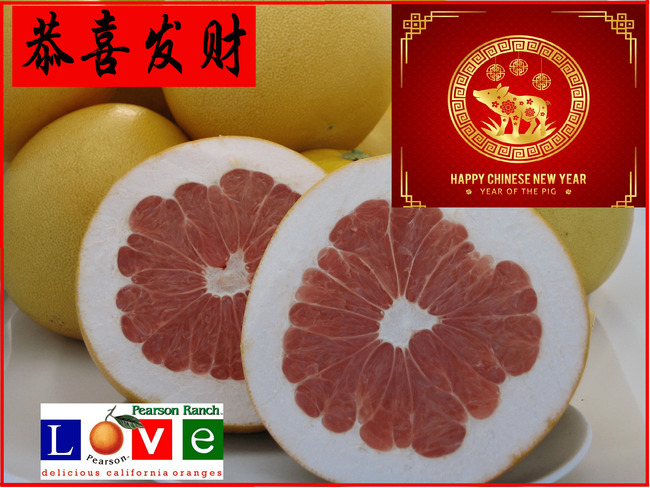 TUESDAY, FEBRUARY 5 TH, 2019 was Chinese New Year ( Year of the PIG ), and to celebrate, Pearson Ranch is proud to offer our "Lucky New Year Pomelo Pack" of 8 beautiful and delicious California grown Pomelos. Enjoy our hand selected and hand packed "lucky" pomelos shipped right to your door. So, whether you enjoy pomelos as part of your traditional Chinese New Year celebrations, send pomelos for the Lunar New Year, or you just want to indulge yourself with these 8 wonderfully delicious and fragrant POMELOS, The "Lucky New Year Pomelo Pack" is sure to please. So "Congratulations And Be Prosperous" this New 2019 Year, and celebrate the "Year of the PIG". Or as it is customary to say in many Asian cultures..."Gung hay fat choy" or in Vietnamese Chuc' Mung` Nam Moi'. In case you were wondering about the sign of the Pig...? So all things considered...it ought to be a very good year! The "Lucky Pomelos" weighs approx. 23 lbs. For further information on Pomelos please call us at 888-667-2643.